BOSSY BETTY: Happy Mother's Day! Hummingbird Update! I thought today would be a good day to show you what's been happening in the nest. And now, for a little video action. "At three weeks of age, the little baby hummingbirds are now looking more like a real hummingbirds. They are testing out their wings more and more in preparation for flight. In the next few days, these little baby hummingbirds will fly away as real adult hummingbirds, never to return back to the nest." 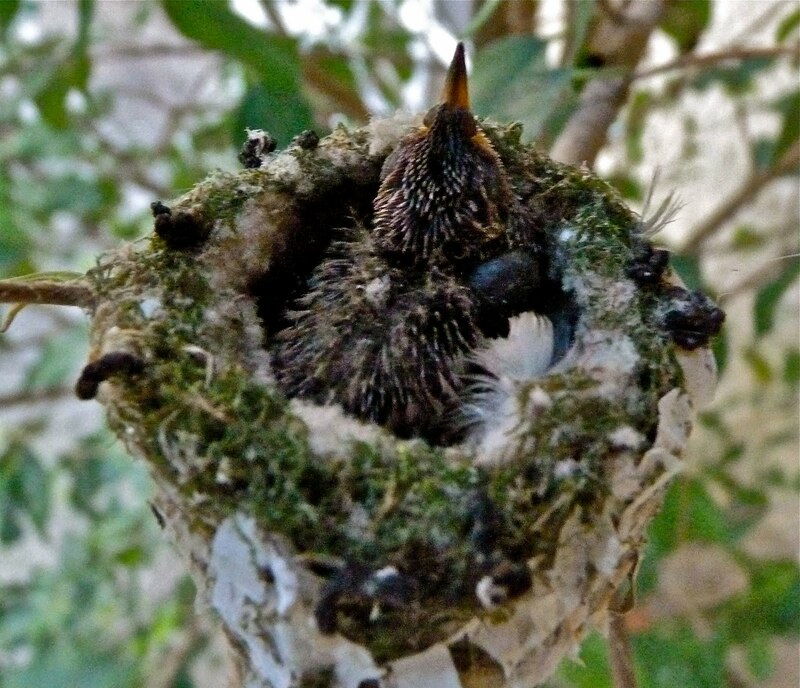 "The mother hummingbirds will still feed their fledging for two to three days after leaving the nest. During this time, she will show them all the good places to catch bugs and get nectar. Then she will chase them off to live on their own." Glad I am not a hummingbird mother! Sonny Boy surprised me with a visit home from his college for Mother's Day. He arrived while I was away and parked down the street so I didn't see his car. I came home, saw a light in his old room, went in to investigate, and there he was, sitting at his desk! Talk about a great surprise. I am so happy to have him back in the nest, if only for a day. He and Evan make my life an absolute joy and I thank them for being incredible sons to this Mama Bird. Bugs and nectar for everyone!! It actually makes me a little sad that they'll be ready to fly soon, never to return. I'm so glad you've been sharing this! Amazing pictures! And a video? I love!! For years, I've been trying to attract bluebirds to a bluebird house first on an old pine tree at my old house and then, on a fence at my new house. After nearly twenty years (really), we had bluebirds last summer!!!! I was so excited, you'd think they were my own children. Like Blue Violet the speed at which baby birds grow up is rather staggering (read: sad) and I was definitely a little blue when my baby bluebirds left the nest. Tell the mother hummingbird happy mother's day! You captured very special moments in nature. Thanks for sharing.Happy Mother's Day! Awesome pictures and video - thanks for sharing them! That is a little sad that they'll never return to the nest - but I suppose that's nature. Awwwwww...thanks so much for sharing. These are such sweet pictures....and the video ....I love it!!!! Happy Mother's Day! I mentioned you in my post today! Awwww these hummingbirds really pack a lot in don't they??? From birth to fledgeling to flight! Amazing for such tiny itty bitty things - good luck to them and THANK YOU for sharing this fab journey from egg to now. I love how how mamma bird started to roost over her chick - awwwwwww!! And great to hear your own babies have come visiting! Awwwww!! HAPPY MOTHER'S DAY to you! I hope you have a wonderful and treat-filled day today. Thank you for my bugs and nectar! LOL! What a great mothers day post.. thanks for posting about the birds. They may never come back but she looks like an awesome mother meanwhile. This is so awesomely cool...how close are you able to get to film this? Looks like right up there. I was just thinking we had not had an update on them for a while. What a cute surprise from your son! Happy Mother's day to you! I thought the voices in the video were equally intriguing! :D Loved the snaps! I don't think i've seen so much bird coverage on any other blog! I love birdies, especially hummingbirds. I don't know how you got so close, but you did a fabulous job capturing this. This is one of the things that makes people think that life is beautiful. Fantastic photos and video! 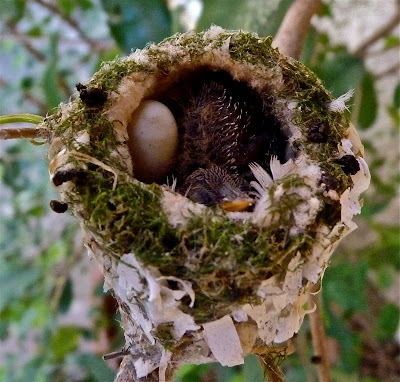 We have hummingbirds, but I've never seen a nest - only photos of nests. This is truly special to see all this action going on! Wishing you a very happy and fulfilling Mother's Day! How awesome post, Betty! Loved the idea too! Great shots! Another great post Betty with awesome pictures! Have a very wonderful Mother's Day! Those are some awesome photos, Betty. Those little birds are just amazing to me. And what a nice surprise you got for Mother's Day. How great for you! I love these hummingbird photos. Glad to see things progressing! How sweet that your son surprised you!! You got me a little choked up in talking about that! And the hummingbirds.... a perfect post for the day!! It's amazing how wonderfully clear the video is! Have a most wonderful Mother's Day, Betty. These photos are beautiful and perfect for Mother's Day. I've never seen a baby hummingbird. How sweet that your son surprised you. I hope you enjoy your visit. Happy Mother's Day. Happy Mother's day Betty! I absolutely love the picture you captured of the mama feeding her baby. This is precious and signifies what this day is all about. How beautiful that you captured it in a picture. Oh and by the way, I do not live far from San Juan Capistrano..I live in Los Angeles. So happy for you, Betty. Thanks for the swallows. Have a beautiful Mother's Day. I have been waiting for these pictures and they were worth the wait, they are fabulous and I am so pleased to see that the little chick is surviving and growing. Three weeks only with Mom? I am SO glad that is not the case for us too. I'm glad to know the hummingbird baby is doing so well. Sounds like a lovely day! Bugs and nectar to you, too! Betty Happy Mother's Day to you and thank you for this most amazing post and video. Oh my word it is just breathtaking to see Mom Hummer in action. Happy Mother's Day! I'm glad both boys have been home to share with you this weekend. I've talked to 2 of my 3 and expected to hear from or see the 3rd child later today. As to the hummingbirds, my husband asked me to pass on that he is a bit jealous. Capturing hummingbirds on video is not easy. We've tried and were not nearly as successful as this. We both loved watching it. Thank you. Happy Mother's Day, Betty! Those were very sweet pictures. I think we should have a Hummingbird's Day! Yay, yay, YAY!!! I was rooting for him! Are you *perched* in 1 spot all day, keeping an eye and camera on the baby? It was great to see the mama feeding him. very beautiful! Happy Mother's Day! Those are incredible photos. I love to watch birds. I have a birdbath by my window where I write...we've all become friends. Great pictures and the video was a real treat. I kind of feel like a hummingbird mom today since both of my little chicks have flown the nest and i didn't get to see either one today. At least human chicks can call home though. incredible footage. thanks for sharing that! wow. But what a wonderful thing for your son to do! Melts my heart, this sort of thing. that is so awesome! I love the series of photos and the video! Very, very cool! I've been reading your blog, but when I went to comment the other day my computer died and that was that for the moment. I enjoy your writing and will be back for more! Pictures are gorgeous, you should work for National Geographic. Humming birds...One of God's most facinating creatures. Love them. Great photos and video! So cool! I can't believe the mother didn't accidentally impale her baby with that beak though. Yipes. So great to get a surprise visit from your son. I enjoyed seeing the pictures and videos!! I am so glad we have more time with our little ones than the hummingbirds!! We have so many hummingbirds here and it is a real joy to sit and watch them, I have never seen a nest before and it was great to view your pictures and watch the video. Betty - what a truly fantastic journey you've brought us on. This was so lovely and I had a smile the whole time while watching the video. Happy Mothers Day to you! 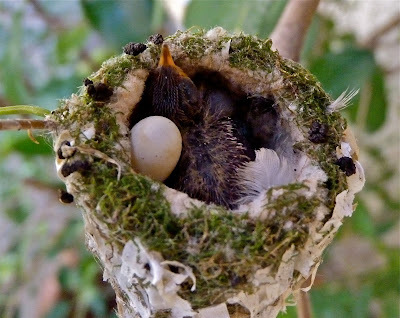 I've never quite understood how a mother hummingbird can feed her baby with that long beak and it doesn't end up coming out the baby birds tailfeathers. Glad you had a pleasant surprise and a wonderful day. Love the pics! Thanks for stopping by my blog. Woohoo!!! That is so cool. I liked the video. It plucked its own feathers out for insulation. That was awesome. Happy Mother's Day!! Beautiful pictures. I loved the video too. Our backyard once had a bird for three months. It had built a nest and took care of the young ones. Once they were ready to fly, they left. They are fantastic photos! All my birds were back in the nest for Mother's Day - it was wonderful. Female hummingbirds check the strength of a prospective nest site by clinging to it or repeatedly landing on it. If the site passes the test, a female will begin to build. The nest will be built on the underside of a palm leaf, on the side of a vertical plant stem, on a small branch, on top of a cactus or many other different locations are used and different species have different preferences. 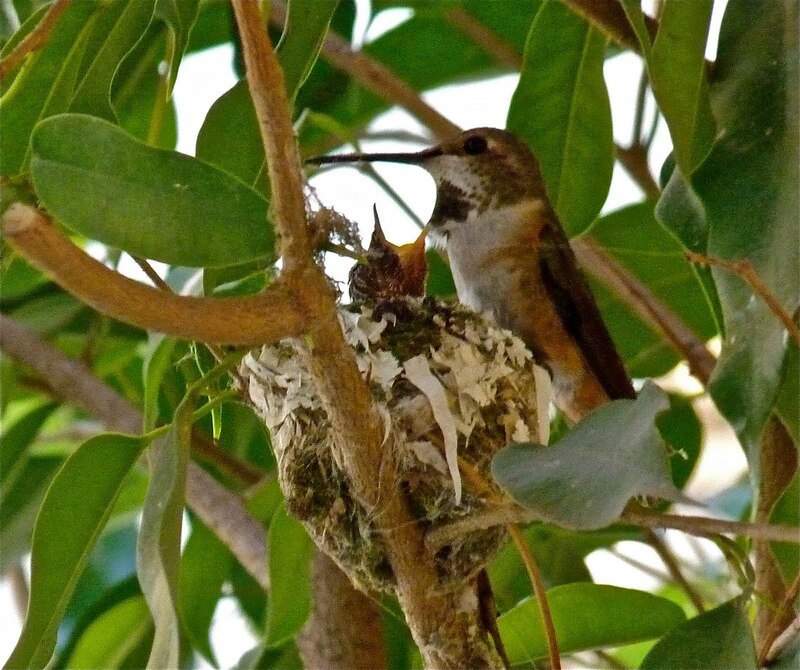 Hummingbirds usually build on branches, but the hermit hummingbirds build nests that hang from vegetation or from a vertical plant stem, root, or rock. 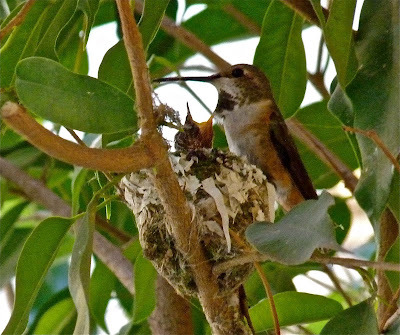 Most typical hummingbirds build cup-shaped nests like the bird’s nests most of us are familiar with. 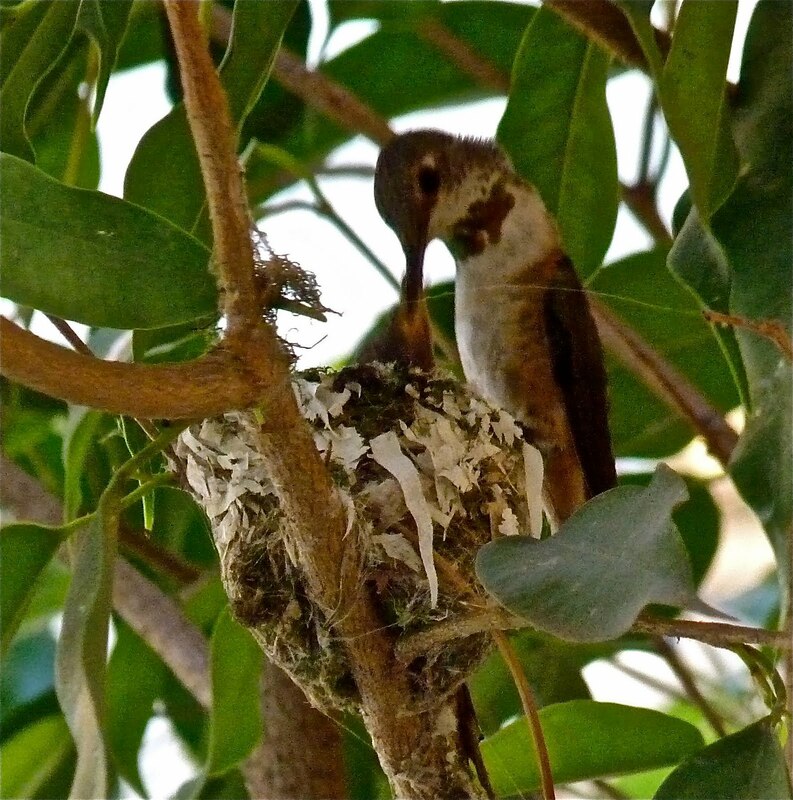 Hermits build cone-shaped nests which hang vertically, attached to something strong enough to support the weight of nest and birds for the breeding season. 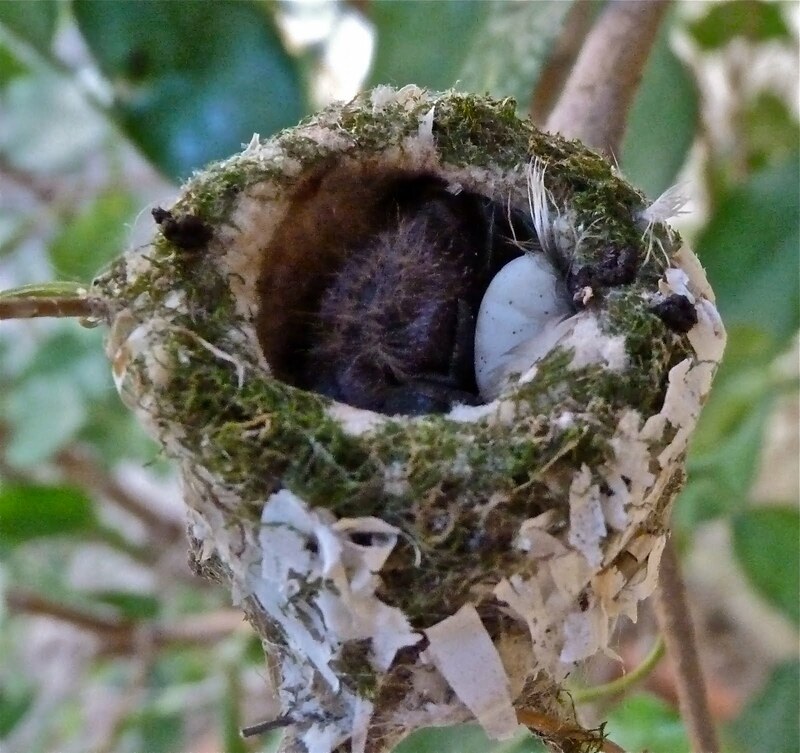 Hummingbird nests are built with pieces of plants and often cobwebs, and females frequently need to repair the nest as the chicks grow. A hummingbird usually lays two white eggs, which are no bigger than peanuts, which hatch within 12 to 14 days after being laid. The young fledge in 18 to 20 days. Hungry nestlings may be seen reaching for the food their mother has brought; the chicks open their mouths in response to air currents created by the beating of her wings. Between three and four weeks after hatching, the young leave the nest and are on their own. click on the lick below. You will be glad you did! what a treat you are Bossy! my favorite part of the video is when momma gets done feeding the baby and then nestles down. Nap time! What a sweet way for your son to surprise you! OH, my gosh, how did you do that?? It is so fantastic. Wonderful photos and video here. You've done a great job of capturing this beautiful creature and her young. And so timely for Mother's Day. It sounds like yours was wonderful. more lovely photos & that video was awesome, i had no idea they stick the food so far down their throat, haha =) Great surprise for you for Mother's Day too!! what incredible footage! and how cool your son surprised you. happy belated mama's day to you! That is some harsh parenting right there. You think the baby birds ever come back every once in a while to ask mom or dad for a 20? Such a beautiful video of a mom feeding her young. Interesting that they never come back to the nest. My son came back several times before he totally fledged. LOL! He has 5 young of his own now. He is hoping several f ledge soon!! Congrats on your POTW. Wow - what amazing photos! Congrats on the POTW mention from Hilary .. you have a great blog! How wonderful!!!! That made me smile. Thank you. Congrats on your POTW mention. That's really cool! Thanks for sharing, and congrats on Post of the Week! I love the pics of the mother feeding her baby! I am so glad I scrolled down to see more about the hummers, this is so cool. The video is great. Hi Betty, Judy (Squirrel Queen) told me about your post on Hummingbirds --so I just HAD to check it out. Judy knows how much I love my birds. Love your hummers... That video is totally awesome. Thanks for letting me stop by. Wow. This is fascinating! Thank you for sharing. My son was captivated by the video! Phenominal!